Muzzles can be a necessity for any dog at some point in their life. As Katalin over at Special Paws Blog recently illustrated, even the most well-trained, lovable dog can run into a situation where a muzzle is needed! In her case, her dog had surgery, and she had been warned that the physical therapy can be painful, causing some dogs to snap or bite to let you know you’re hurting them. Because of this, the therapist requested that dogs wear muzzles while undergoing therapy. For a dog not used to wearing a muzzle, having one on can be a cause for a lot of anxiety, and would make the physical therapy scary when it didn’t need to be. The same is true for an injured dog who is terrified and in pain. If he is not used to it, putting a muzzle on him can amplify that fear a large amount. Training your dog to wear a muzzle, even if you see no immediate need, will help prevent stress in your dog if he ends up in a situation like these and needs to. Then there are dogs who have bitten in the past in response to certain triggers. When working to counter condition your dog (teach her that the trigger is not stressful and thus no longer causes her to feel the need to bite) you may want her to wear a muzzle so that if you miss a warning sign she’s giving you no one is injured. This is especially important if you need to enlist the help of other people in counter-conditioning your dog. For example, if your dog will bite when her paws are handled, you will need to teach her to accept not only you handling her paws, but other people. While you may be willing to risk a bite, you don’t want to assume that your helpers will, as well. In situations such as these, a muzzle can be a good tool. Read that again, because it is important. A muzzle is a tool. It is not a solution to a dog’s biting, it is a tool you can use while teaching her to not feel the need to bite, or that you can use in a short term situation when your dog is in pain and is likely to not have good control of herself. If you are working with a biting dog, it can help ensure everyone involved is safe. However, while this article is only about training your dog to accept a muzzle, recognize that it is only a useful tool either in short-term situations or when paired with appropriate training for the underlying biting behavior. So you’ve decided that you want to teach your dog to accept a muzzle, either because you see an immediate need, or just for the possibility of needing it in the future. How do you ensure that your dog not only doesn’t find a muzzle stressful, but that he actually enjoys wearing it? I’ll go through the whole process, but be sure to break up your training in to 5 or 10 minute sessions, so the training stays fun and stress-free! Introduce the muzzle to him slowly, and let him choose how quickly he will put it on. Get out the muzzle, and a bag of tasty treats. Now offer your dog a treat so that he has to stick his nose towards the muzzle to get it. Don’t go too quickly! How close your dog has to put his nose will be determined by his comfort level. Remember, the goal of this training is that your dog does not find the muzzle stressful. If you push him too quickly, even with food around, the muzzle will be associated with stress in his mind. Once your dog is eagerly looking to the muzzle, waiting for the next treat to appear, move the treat so it is a little further into the muzzle. Now your dog will have to put his nose either closer to or farther into the muzzle to get the treat (depending where you started). This may cause a little hesitation, but it shouldn’t cause him to balk. Ideally, your dog will be so happy with the game you’re playing that he won’t mind moving his nose an extra half-inch into the muzzle at all! If he balks or seems to get stressed, make the game easier. Put the treat back to where it was, or even further away, for a few repetitions, until he is having fun again. Slowly increase how far into the muzzle your dog has to put his nose to get the food. If you move slowly enough, you should get to the point where your dog is happily jamming his nose all the way into the muzzle to get the offered treat. Once you hit this point, stop showing him the treat. Hold out the muzzle and see what he does. If he makes a move to put his nose in it at all, say “Yes!” in a happy tone, and offer him the treat inside the muzzle again. This way you are teaching him that you’re playing the same game, but that the muzzle itself is a cue to put his nose in and get rewarded, not the treat. This will allow you to muzzle him even if you don’t have any treats on you in an emergency. Repeat this game until you can offer the muzzle, and he will eagerly stick his nose all the way inside and wait for his treat. At this point you can start to fasten the muzzle. Up until now you have simply been holding it out and letting him put his nose in, but if you were to let go it would either fall off or be easily pawed off. You are just going to add to the rules of the same game you have been playing all along that your dog loves. Offer the muzzle and let him eagerly stick his nose in, but don’t treat him yet. Instead reach out, grab the straps, fasten them, and give the treat. As soon as he takes the treat unfasten the strap and take off the muzzle. Once the muzzle is off ignore your dog for a few seconds, and repeat the procedure. Note: If you are using a cloth or mesh muzzle which holds your dog’s mouth closed, he may not be able to take a treat, or even lick some baby food off a spoon. If that is the case, put on the muzzle, and give him a different reward. Pet him, cuddle him, give praise, run with him (see the safety note below), do something that your dog loves that doesn’t involve opening his mouth. Once the muzzle is off ignore him for a few seconds, as above. This teaches your dog that having the muzzle fastened means that the good things are coming. Once it comes off life is not bad, but it’s a lot less exciting and fun! At first you may not be able to fasten the muzzle all the way. That’s fine. Remember: the goal is to keep your dog happy! If at any time his tail tucks or he acts upset, slow down and go back a few steps. This should be an enjoyable process! If he starts to get unhappy when you go to fasten the muzzle, start by just reaching out and touching the strap while his nose is in the muzzle and then rewarding him, slowly building up to fastening it. There is no step too small to take in your progress! 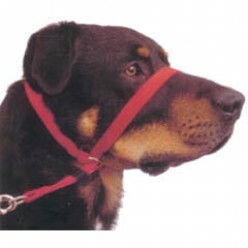 As your dog accepts the muzzle being fastened, leave it on for longer and longer periods of time. Keep the rule that while it is on, good things are happening, once it comes off, all the good things stop. No congratulating your dog for doing so well after you take it off! That will teach her that the muzzle coming off is desirable, and she will not like having it on. Instead, congratulate her while it is on. That’s the hard part, after all! Slowly build up the amount of time your dog will happily wear the muzzle, always taking it off before she gets stressed. Once she is happily wearing it for more time than you would need to work on desensitizing her to her trigger (having her paws handled in the above example) you can start counter-conditioning her trigger safely, with her muzzle on and adding no stress. If you’re training it for a rainy day, build up until she will happily wear it for at least 10 minutes. Remember to practice with the muzzle occasionally so your skills stay sharp, though once she likes it the rewards can go down in value and frequency. Congratulations, you now have a dog who gets excited when he sees the muzzle come out, and can’t wait to get his nose into it! Whether you need it right now, or might in the future, you can add one more check to your list of mastered skills. Never leave a dog unsupervised wearing a cloth or mesh muzzle which holds their mouth shut. Also never leave it on for longer than about 20 minutes, especially in warm weather. While wearing a cloth or mesh muzzle a dog cannot pant or drink, which can be dangerous for long periods of time, especially in warm weather. This is the main reason I typically prefer a basket muzzle of either wire or plastic, which completely encases your dog’s mouth but does not hold it shut. Another reason is that with a cloth or mesh muzzle while a dog cannot bite, he can pinch since there is typically some give in it. This can still be painful! All dogs, no matter what their size, need exercise. Walks can be a great way to not only physically exercise your dog (and yourself! ), but to mentally exercise him through all of the sniffing, exploring and experiencing he does. However, when your dog pulls on the leash, walks quickly cease to be fun. When they’re no longer fun, we tend to take our dogs out less frequently…leading to them getting more excited when they do get out…leading to them pulling harder…leading to us walking them less frequently…and so on, until our dogs almost never go out for the exercise they need. Pretty soon other behavioral problems start to occur due to the excess mental and physical energy, things like barking, digging, chewing, hyper-active behavior, door dashing, and the list goes on. So how can we teach our dogs to stop pulling? First, think about why your dog pulls. It’s not to annoy you, it’s because they want to GO and see that leaf, and that bush, and what just moved?, and lets keep going, and there’s so much to see we better go or we’ll miss it!, and ooooooh, another dog!! Our dogs pull because it works: when they pull, they get to go where they want. Now, the person on the other end of the leash may be yelling and swearing at them while they go there, but that does not come close to outweighing the coolness of everything around them. Even if a dog is receiving leash corrections, or wearing a prong or pinch collar, often his brain is so consumed with taking in everything around him, and the pain or discomfort just doesn’t penetrate. Combine this overstimulation and automatic reward of moving forward with a natural instinct to pull against pressure, and it becomes clear why our dogs pull! Now that we understand their motivation, what is the best way to stop them from pulling? Take away their motivation: don’t let them move forward while they are pulling. From now on, whenever your dog is on the leash it is her job to keep the leash loose. When you are walking your dog, the instant you feel tension in the leash beyond what you have decided is acceptable, plant your feet and do not move. Do not call to your dog, do not jerk on the leash, just wait and feel. Eventually, when your dog is not getting rewarded by moving forward, and all of the stimulants around her aren’t changing and staying exciting, she’ll look back at you as if to say, “Well aren’t we going to go?” When she does this the leash will slacken, you can tell her good, and move forward. You may only take one step before there is tension in the leash again, so again, you will plant your feet and wait. Pay close attention to what you can feel through the leash; often you can’t see your dog shift visibly, but she does shift enough that the tension in the leash is relieved. Once you feel there is no more tension in the leash, say, “Good!” and move forward. By making the rule about when your dog gets to move forward based on how the leash feels rather than where your dog is relative to you, you can train your dog to keep the leash loose no matter how much slack you’ve given her. By not speaking to her to encourage her to loosen the leash she learns that she has to keep the leash slack all the time, not just when you ask her to. At first this is a very frustrating process. You may be standing on the street for 3 straight minutes, waiting for your dog to relax enough to even try to figure out how to move forward again. It may take you 30 minutes to get down your driveway. If at all possible, use walks for training and exercise your dog in other ways; at off leash parks, playing fetch in the backyard, swimming, whatever works; until they have learned the rules. This will help you get less frustrated about how long it is taking you to go down the block, because there’s no need to go down the block! The purpose of the walk is to move any distance without tension, not to cover a certain amount of ground. Depending on how long your dog has been pulling and being automatically rewarded for it, it may take your dog one day to figure out the new rules, or it may take several weeks. Most dogs will start to figure out that when you stop they need to shift back pretty quickly, but it can still take a long time until they are reliably keeping the leash slack so you don’t have to stop. If you are consistent, however, you will end up with a dog who is a pleasure to walk not only at your side, but ranging in front of you, or even 10 or more feet out. There are many brands of head collars, each with some slight differences from the others, but they all work on the same principle. Another tool that is often useful in reducing pulling is a no-pull harness. There are many types of these, as they can work by swinging the dog’s body around or causing slight discomfort in various ways when the dog pulls. A no-pull harness will give you less control than a head collar, but for dogs with short noses or dogs who do not pull too strongly, a no-pull harness can make a difference. For a summary of different training aids for pulling, including the various types of no-pull harnesses, see this table. Walks should be a time you and your dog can enjoy together. It is important, especially if you have a larger or more active breed, that your dog gets out for a walk every day. Almost any of your dog’s bad behaviors can be improved simply by exercising him sufficiently. The good news is, with the right tools and the right training, your dog can walk nicely on a leash! No, I’m not talking about stuffed animals or plush squeaky toys, I’m talking about dog toys that you stuff with food. These interactive toys have a myriad of benefits both for your dog and for you. Is your dog bored and acting out (barking, digging, chewing, etc.)? A stuffed toy will exercise her brain and make her think, helping to mentally tire her out so she has less excess energy to burn. Do you need to work on something without your dog’s undivided attention? Give her a toy stuffed with food she enjoys, and she will stay occupied while you work. Does your dog inhale her food, keeping her from getting all of the nutritional value from it and possibly leading to coprophagia (eating poo)? Put her meal in a stuffed toy so she can only eat small amounts at a time. When you leave does your dog get anxious and stressed? Always leave her a toy stuffed with a well-liked food, so she has something to look forward to at your parting. To introduce a stuffed toy to your dog, first load it so that the food will fall out at a slight touch. Give your dog the toy, and sit with her. If she’s not trying to figure out how to get the food out, push the toy around some to encourage her, and let her eat any food that falls out. Each time you bring out the toy you can make it a little harder for her to get the food out. Before long she’ll be wagging her tail as soon as you pick it up! Note: I did not receive any promotion or compensation for suggesting these toys. This is one of my favorite interactive toys, because it can be used in so many ways! The Twist ‘n Treat is made up of two halves that screw together in the middle, each of which has two divots in the edge that food can fall out of. Your dog noses, paws, or tosses the toy to cause dry food to fall out of the openings, or licks in the opening to get smear-able food out. The size of the openings is adjustable – the tighter you twist the two halves, the smaller the openings. Because of this, Twist ‘n Treat can be filled with dry food or treats of many different sizes, and still be challenging and fun. Additionally, this lets you adjust the difficulty level for your dog; if you want to keep him busy for awhile, twist it tighter so he has to work harder for each piece of food, if you just want to slow him down so he doesn’t eat too quickly you twist it less so food falls out easily but isn’t all available at once. This also lets you set it wider and smear peanut butter or other similar foods on the inside for your dog to lick out. The Twist ‘n Treat comes in three sizes and two strengths of plastic (a lighter purple for puppies and a darker purple for dogs), so you can find one that’s perfect for your dog! The KONG is a classic toy that many dog owners have heard of. It comes in multiple strengths of rubber, including rubber designed for puppy chewing, average chewing, heavy chewing, and senior chewing, and a variety of sizes, so there is a KONG for every dog. It is a hollow, bulbous toy with a medium sized hold in the wide end and a very small hole in the small end. It can be filled with a wide variety of foods, but most commonly owners will smear peanut butter on an inner surface. Because of the odd shape and the single access point, dogs have to work hard to get all of the peanut butter out, and really think about how to move their tongue and hold the toy. In addition to peanut butter, a KONG can be filled with a wide variety of fruits, veggies, breads, baby food, wet food, and even dry food if the large opening is capped with a substance like peanut butter. For relief from teething or a cool treat on a hot day, the KONG can be stuffed and frozen. This also typically increases the difficulty for the dog to empty the KONG. The Tricky Treats Ball is a hard plastic ball with many divots shaped into it. One of those divots is actually a hole, leading to the hollow interior of the ball. Your dog noses or paws the ball, causing food to fall out of the hole.There is a lip around the edge of the hole, so food doesn’t fall out too easily, especially once the ball starts to get lower on food. The ball is not adjustable, but if you’re OK with your dog chasing a ball around your house, this toy may keep him entertained for a long time! The Buster Cube is a large, hard plastic cube with a hole in one side, which dry treats fall out of when the cube is pushed. The toy is adjustable; by rotating the central chamber you can change how hard it is for the food to fall out. The Buster Cube is a difficult toy for dogs to play with, its sides are smooth plastic so claws and teeth cannot grip it. However, if you have a larger dog who can figure it out, it can hold a lot of food and keep him entertained for a long time! For a bone-oriented dog, this toy is a great choice! Shaped as a fairly large rubber bone, each end has a notched hollow tube running through it, perfect for stuffing full of cheese, peanut butter, wet food, or other goodies your dog likes. Because of the ridges and the dimensions of the hole this can keep a motivated dog busy for a long time. Even after much of the food is gone it is still a fun shape to chew that can keep her working! If your dog is interested, this is often an especially good toy to give them when you’re leaving, since it is challenging and fun enough to capture their attention and keep it until long after they’re worried about your absence. In this blog, certified trainer of Companions Dog Training will share information on topics related to dog training. Our goal at Companions is to help all dogs lead full, happy lives with their human families, and to help families thoroughly enjoy having a dog in their home. To this end, we love to spread the word about new tools, ideas, and techniques that can help canine and human family members live together more happily. If you have any topics you'd like to learn more about, please let us know. Happy training!